The Transportation Security Administration (TSA) has such poor management over its airport security equipment that the agency does not know if its screening machines are working, according to an audit by the Office of Inspector General. American lives may be at risk due to ineffective maintenance of its equipment, which has cost taxpayers $1.2 billion. "The Transportation Security Administration (TSA) is not properly managing the maintenance of its airport screening equipment," the Department of Homeland Security (DHS) inspector general audit said. "Specifically, TSA has not issued adequate policies and procedures to airports for carrying out equipment maintenance-related responsibilities. Because TSA does not adequately oversee equipment maintenance, it cannot be assured that routine preventive maintenance is performed or that equipment is repaired and ready for operational use." "If the equipment is not fully operational, TSA may have to use other screening measures, which could result in longer wait times and delays in passenger and baggage screening," the OIG said. "More importantly, our prior work on airport passenger and baggage screening demonstrated that these other measures may be less effective at detecting dangerous items." "Consequently, the safety of airline passengers and aircraft could be jeopardized," they said. 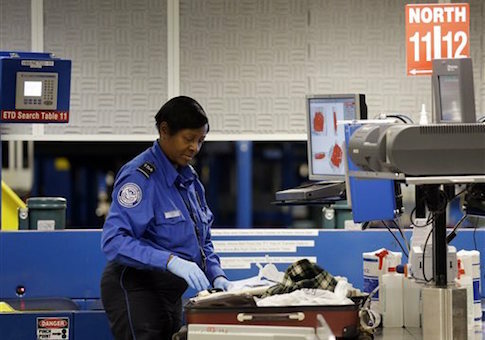 Flaws in the TSA’s Field Data Reporting System (FDRS), which keeps track of how many bags go through various pieces of security equipment, have left TSA personnel unsure whether machines that are used to detect bombs are working properly. "According to TSA, FDRS may not be accurately capturing the types of bags running through [Explosives Detection System] EDS machines, which help determine whether a machine was in operational mode or test mode," the audit said. "Therefore, we could not be certain whether a specific EDS machine was operational or if it was in test mode at a specific date and time." "As a result, the contractor may have incorrectly reported that the equipment was out of service, but it is also possible that passenger bags were screened by equipment that was not fully operational," the OIG said. The TSA contracts out its maintenance work, and currently has four contracts worth approximately $1.2 billion. The agency spent $251 million on maintenance during the last fiscal year. Maintenance is overseen by the TSA’s "Office of Security Capabilities’ Integrated Logistics Support branch." For the audit, the OIG visited nine airports and examined Explosives Trace Detection (ETD) machines, Advanced Imaging Technology (AIT) machines (commonly known as "body scanners"), Bottled Liquid Scanners; x-ray machines; walkthrough metal detectors; and checked-baggage screening equipment. Every airport had problems maintaining its equipment, and technicians also had issues with TSA employees. "At the nine airports we reviewed, local TSA personnel said maintenance contractor technicians do not always notify them when equipment is repaired or obtain TSA’s sign off when maintenance has been completed," the audit said. "According to the technicians we interviewed at one airport, local TSA personnel are not always available or willing to accept the responsibility of acknowledging the equipment has been repaired." The OIG also found that the TSA has no official guidance for airports on how to track and monitor preventive maintenance of its security equipment, and that the agency "relies on self-reported data provided by the maintenance contractors and does not validate the data to confirm that required preventive maintenance actions have been completed." Contractor-provided data is also "incomplete," and the TSA does not penalize contractors that fail to complete mandatory preventive maintenance. The TSA had no documentation that it had completed required daily and weekly inspections of equipment at seven of nine airports. Further, TSA employees "did not know whether preventive maintenance had been performed" at six out of nine airports. "Without diligent oversight, including implementing adequate policies and procedures and ensuring it has complete, accurate, and timely maintenance data for thousands of screening equipment units, TSA risks shortening equipment life and incurring costs to replace equipment," the OIG said. The TSA agreed with the majority of the OIG’s recommendations on how to improve its oversight of security equipment, but was upset by the title of the audit report, which reads: "The Transportation Security Administration Does Not Properly Manage Its Airport Screening Equipment Maintenance Program." This entry was posted in National Security and tagged TSA. Bookmark the permalink.